Presenting Dollhouse #1 Dollhouse by Anya Allyn. 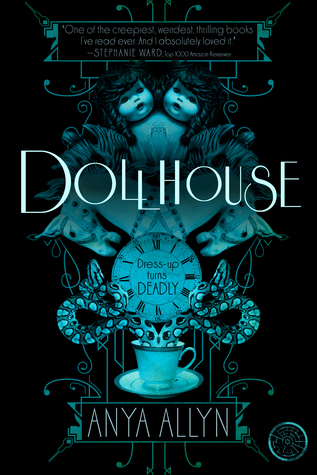 Brilliantly articulate and spookily original, Anya Allyn's Dollhouse is a great addition to the gothic thriller list. Its the attack of the clowns and the dolls and no one is safe. With a tagline of 'Dress-up turns deadly' and a gothic reworking of the cover and you have this beauty. Starts out simple to turn uniquely thrilling quite soon. Cassie, Ethan and Lacey are searching for their missing friend Aisha who had gone missing on a trip in the mountains. The strange Fiveash Mansion is connected but as they search for their friend, they stumble upon the deadly secrets of that strange mansion. Its a race against time and Cassie and Ethan must figure out this twisted mansion, not only to gather the truth but also to find the way out in time to save themselves. Highly and graphically imaginative, twisted and illustrious. This is the best scary gothic horror I have read so far. A little confusing sometimes but the best thing about it is that the suspense remains constant. tethering us to our seats as we can't help but keep reading till the end, building to a crescendo and ending at a cliffhanger. I really really have no patience withe cliffhangers but I'm definitely eager to read what happens next in Paper Dolls. And while the original cover to Dollhouse in quite beautiful, I must report that this one is simply exquisite and even more attractive. "A highly imaginative and original gothic horror that will keep you occupied"
This book sounds amazing! I don't know if I have it on my Goodreads list yet or not, but it will be going on there for sure!